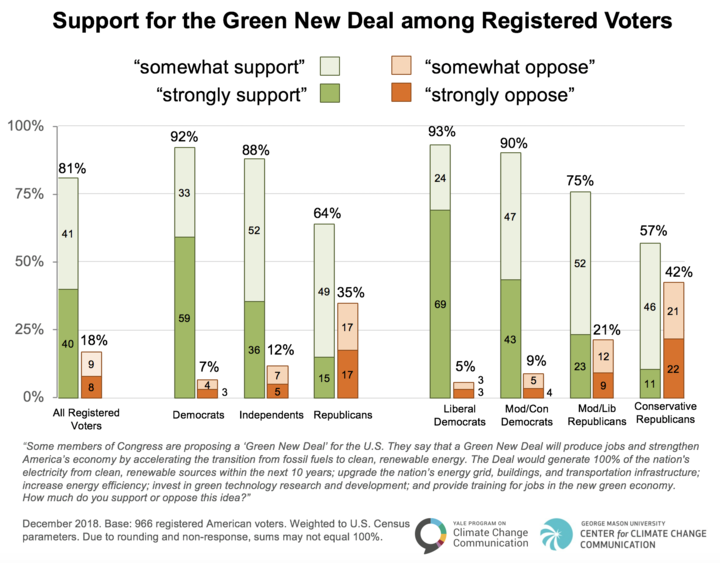 Support is growing in the United States for a Green New Deal. Though there are competing visions for what that looks like, essentially, a Green New Deal includes a rapid transition to a clean energy economy, a jobs program and a stronger social safety net. We need a Green New Deal for many reasons, most obviously the climate crisis and growing economic insecurity. Each new climate report describes the severe consequences of climate change with increasing alarm and the window of opportunity for action is closing. At the same time, wealth inequality is also growing. Paul Bucheit writes that more than half of the population in the United States is suffering from poverty. The Green New Deal provides an opportunity for transformational changes, not just reform, but changes that fundamentally solve the crises we face. This is the time to be pushing for a Green New Deal at all levels, in our towns and cities, states and nationally. Hundreds gathered in San Francisco with the youth-led Sunrise Movement on Dec. 11. Peg Hunter / Flickr, CC BY-NC 2.0. 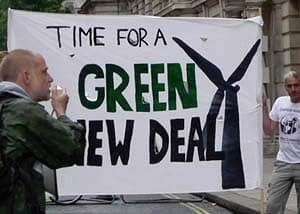 The idea of a Green New Deal seems to have arisen in early 2007 when the Green New Deal Group started meeting to discuss it, specifically as a plan for the United Kingdom. They published their report in July 2008. In April 2009, the United Nations Environmental Program also issued a plan for a global Green New Deal. In the United States, Barack Obama included a Green New Deal in his 2008 presidential campaign and conservative Thomas Friedman started talking about it in 2007. Howie Hawkins, a Green Party gubernatorial candidate in New York, campaigned on a Green New Deal starting in 2010. Listen to our interview with Hawkins about how we win the Green New Deal on Clearing the FOG. Jill Stein campaigned on it during her presidential runs in 2012 and 2016, as have many Green Party candidates. Alexandria Ocasio Cortez (AOC), who ran for Congress as a Democrat and won in 2018, has made the Green New Deal a major priority. With the backing of the Sunrise Movement, AOC pushed for a congressional committee tasked with developing a Green New Deal and convinced dozens of members of Congress to support it. Speaker of the House Nancy Pelosi sidelined that idea by creating a climate committee headed by Kathy Castor, which has no mandate to do anything and lacks the power to write legislation and issue subpoenas. Now the Sunrise Movement is planning a tour to build support for the Green New Deal. At each stop they will provide organizing tools to make the Green New Deal a major issue in the 2020 election season. This week, more than 600 organizations, mostly environmental groups, sent a letter to Congress calling on it to take climate change seriously and design a plan to end dependence on fossil fuels, a transition to 100% clean energy by 2035, create jobs and more. Indigenous leaders are also organizing to urge Congress to pass a Green New Deal that is “Indigenized,” meaning it prioritizes input from and the inclusion of Indigenous Peoples. Survey data shows the strongest support for a Green New Deal among liberal Democrats. The Green New Deal, as a tool to address climate change and economic insecurity, could be transformative in many ways or it could reinforce current systems. 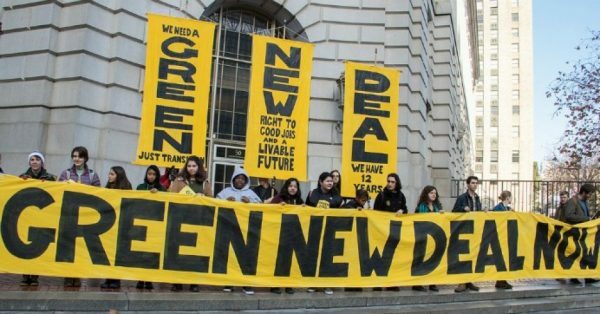 Our political system is inclined towards programs that do the latter, so it is critical that the movement for economic, racial and environmental justice and peace is clear about what we mean by a Green New Deal. At the heart of the issue is capitalism, a root cause of many of the crises we face today. Capitalism drives growth at all costs including exploitation of people and the planet. It drives competition and individualism instead cooperation and community. It requires militarism as the strong arm for corporations to pillage other countries for their resources and militarized police to suppress dissent at home. Capitalism was in crisis in the late nineteenth and early twentieth centuries when, like today, there was great inequality and a political system that catered to the wealthy. Progressive, populist, labor and socialist movements were pressing for significant changes. This came to a head in the depression when tens of thousands of Bonus Marchers occupied Washington DC during the summer of the 1932 presidential election demanding their bonus pay from World War I. The newly-elected President Roosevelt was forced to act, so he put reforms in place called the New Deal. While the New Deal brought relief to many people through banking reform, Social Security, jobs programs and greater rights for workers, it was not transformative. Some argue that the New Deal was essential to save capitalism. It relieved suffering enough that dissent quieted but left the capitalist economic system intact. In the decades since the New Deal, monopolization, inequality, and exploitation have again increased with the added crises of climate change and environmental destruction. This time around, we need a broad Green New Deal that changes the system so there is greater public ownership and democratization of the economy. It can also be used to address theft of wealth from Indigenous, black and brown communities. And it can set us on a path to end US imperialism in the least harmful manner. It is interesting that the Yellow Vest movement in France is also seeking transformative change from a representative government to one that uses greater participation through direct democracy. System change is needed to confront these economic and environmental crises. One alternative system gaining traction is ecosocialism which combines the insights of ecology with the necessity for worker’s rights and public control over the economy. We discussed ecosocialism with Victor Wallis, author of “Red Green Revolution: The politics and technology of ecosocialism,” on Clearing the FOG. The Green Party divides the Green New Deal into four pillars: An economic bill of rights, a green transition, financial reform, and a functioning democracy. The economic bill of rights includes not only a job at a living wage for all who want it but also single payer healthcare, free college education, and affordable housing and utilities. The green transition to renewable energy sources includes building mass transit, “complete streets” that promote walking and biking, local food systems and clean manufacturing. Financial reform includes debt relief, public banks and breaking up the big banks. And the democracy section includes getting money out of politics, guaranteeing the right to vote, strengthening local democracy, democratizing the media and significant changes to the military. We would add to this prioritizing the involvement of Indigenous, black and brown communities. As Jon Olsen writes, ecosocialism is now part of the platform of the Green Party of the United States and has entered the political dialogue. Join the Green Power Project national call on Thursday, January 17 at 8:00 pm Eastern to learn more about the Green New Deal. Click here for details. Conditions are ripe for a Green New Deal. Wealth inequality continues to accelerate. As Lawrence Wittner describes, we have a new era of Robber Barons like the Waltons and Jeff Bezos who pay low wages and rake in millions in public subsidies for their new facilities. They use their economic power to influence lawmakers so laws are passed that increase rather than threaten their riches. A new report shows that 40% of people in the United States have negative wealth; they are in debt. And another 20% have minimal wealth, meaning 60% of people in the US have virtually no assets. The report was focused on millennials finding they are less well off than previous generations. Anthony DiMaggio, who wrote about the report, also found that the affluent are oblivious to the high degree of inequality in the United States and that without this understanding, they are unlikely to support policies that reduce inequality. The Democratic Party is starting to get the message. With student loan debt at a record $1.465 trillion, twice the amount in 2009, candidates are starting to talk about this issue. Members of Congress in the House are planning to hold hearings on National Improved Medicare for All and increasing Social Security. Democratic voters strongly support these changes, so the Democrats are feeling compelled to appear to be taking action on them, though this could mostly be for show to keep people from leaving the party in the lead up to the 2020 elections. To win a Green New Deal, which could include a stronger social safety net, we will need to unite as a movement of movements and make the demand impossible to ignore. Uniting across issues makes sense because the Green New Deal is broad, addressing multiple crises at once. And we will need to push issues that Democrats will not want to discuss, such as nationalization of industries, more democracy, and cuts to the military. Bruce Dixon of Black Agenda Report urges us to organize not just nationally but at the state level too by introducing plans for state Green New Deals. We can work at many levels to build the demand for a Green New Deal. Talk to people in your community about it. Start local initiatives for clean energy, local food networks, protecting public schools and water systems, promoting cooperatives and more. Push your state and federal legislators too. This is an opportunity to unite in support of a bold new vision for our society. Margaret Flowers and Kevin Zeese co-direct Popular Resistance where this article was originally published.